You are about to share experiences with the salt water people of the Dampier Peninsula. You will experience white sandy beaches, giant tides, exotic wildlife and a range of unique cultural experiences that include; bush tucker and cultural tours, local cuisine, mangrove and mudcrabbing tours, fishing and other ocean based activities. Ngaji gurrjin, nyamba buru, Yawuru; greetings everyone, welcome to Yawuru country, your starting point for your Ardi experience. 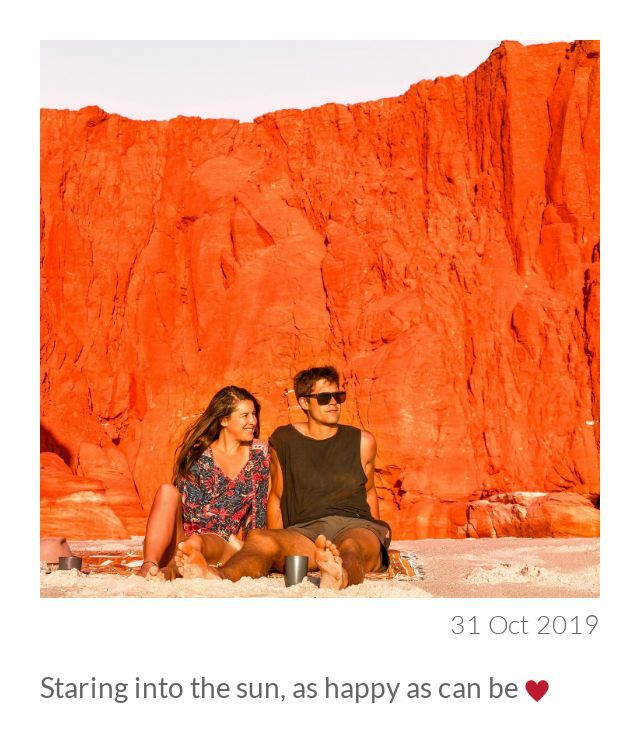 You can download the Yawuru Language app from Google Play and Apple App store. Look for Yawuru Ngan-ga.
April sees daily average maximums of 34 degrees and daily average minimums of 22 degrees. In May the average maximum is down to 31 and minimums down to 18. On average there is less than 2 days of rain each month in this season. You can expect lovely sunny days with cool mornings and evenings. We are coming to the end of our spectacular thunder and lightning storms. Broome experiences awesome sunsets all year round. Casual light clothing, casual dress for travelling and activities and smart casual for evening dining is recommended. Include comfortable walking shoes, sunscreen, sunglasses, hat, insect repellent, towel, swimwear, all-weather coat/jacket. 2,300 kms from Perth, 1,800 kms from Darwin. Yes, Broome is remote but it’s worth the journey. Qantas, Virgin Australia and Airnorth fly regularly to Broome. Did you know Qantas fly direct to Broome from Sydney, Melbourne and Brisbane? Broome is in the Kimberley region, it’s the southern gateway to the Unique Kimberley and to your Ardi experience. There is nowhere else in Australia like Broome. This 1890’s pearling port on the shores of Roebuck Bay is jam packed with fascinating history, multicultural heritage, Asian fusion cuisine, colourful characters and distinct Asian Colonial Architecture. Saltwater crocodiles inhabit the waters of the Dampier Peninsula, be cautious near water and always seek knowledge from the locals before swimming. Arrive Broome, pick up your 4WD hire car, check the road conditions of the Cape Leveque Road, then check in to your accommodation. Yay – you’re here! Be aware that fuel and stores are limited on the peninsula. Before you head off tomorrow do a grocery shop in Broome and purchase your favourite liquid refreshments for your sundowners. Before you head off make sure you pick up a Uniquely Broome Traveller's Guide to Broome and Dampier Peninsula. Now relax, free time to enjoy your resort before heading to Cable Beach to experience your first Broome sunset. Check with reception what time sunset is. Head to Cable Beach Club Resort & Spa Sunset Bar or Zanders Cable Beach for an icy cold beer or cocktail, go the Broome mango daiquiri. If you choose the Sunset Bar for your sunset drink, you’ll see the camel trains slowly plod past on their way home at twilight. Look out for the Shinju Matsuri Pedicabs – a fun alternative transport option. There are many dinner options for a relatively small town. Some of my favourites are The Aarli, The ZooKeepers Store, The Bali Hai Cafe, The Deck at Kimberley Sands, The Club Restaurant, and the Mangrove Hotel. We really do have a good selection, Indian, Thai, Chinese, Japanese, Italian, Seafood, Tapas. Ask a local their favourite restaurant and why. Early night tonight, tomorrow morning you’re heading north up the Dampier Peninsula for your unforgettable Ardi experience. Get an early start, head out on the Broome highway to the Cape Leveque Road turnoff 10km out of town. Turn left, your adventure has started. The infamous Cape Leveque Road is 220 kms long. About 130km of the road is sealed and the rest unsealed, red pindan dirt road. 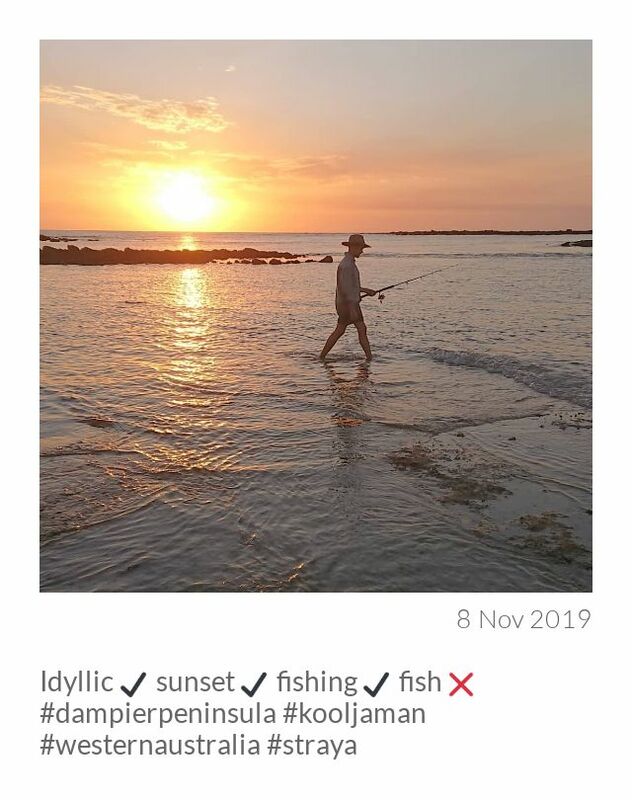 The Dampier Peninsula coastline, Indigenous communities and authentic cultural experiences offers you an amazing opportunity to learn all about the Indigenous people’s traditional lifestyle. Learn fishing techniques for mud crab and fish, the six seasons, bush tucker, bush medicine, ancient footprints, skin groups, spear and boomerang making and throwing, hunting techniques and more. The beaches are incredible, so scenic! Great for snorkelling, swimming, walking, relaxing, fishing, spotting whales, turtles, sea snakes and dugong. See the force of the giant tides racing in and out and the many whirlpools formed. The colour of the water is unforgettable. Visiting Ardi means you are entering Aboriginal land. Luckily for us, the peninsula is made up of small communities offering a broad range of accommodation, bush camping, safari tents, camping grounds with great infrastructure, beach shelters, self contained, and deluxe accommodation. The peninsula is also home to Australia’s oldest operating pearl farm at Cygnet Bay offering brilliant accommodation, pearl showroom, tours, swimming pool and licensed restaurant, Shell. Kooljaman at Cape Leveque has a great choice of accommodation, my favourite are the beach shelters. While there do a scenic flight over the Buccaneer Archipelago and Horizontal Falls plus Bundy’s and Brian’s tour leaves from Kooljaman. Sunset drinks at Western Beach and a meal in the alfresco restaurant Raugi's is not to be missed. Remember to byo alcohol. Other places to stay Mercedes Cove, Goombaragin Eco Retreat, Lombadina, Middle Lagoon, Banana Well. The first stop on your Ardi adventure should be the Beagle Bay Aboriginal Community, home of the Beagle Bay Church. The church was built by Pallotine monks and local Aboriginal people, completed in 1918. Its famous for its pearl shell alter. After you've been amazed by the magnificent Sacred Heart Church it might be time to find a stretch of beach to swim, or maybe throw in a line. Time means little up here. The next community north is Lombadina. They have a great art and craft centre, chat with the local staff and browse through a variety of traditional and contemporary art and craft on display. Traditionally carved pearl shell, trochus bangles and pearl and ebony pendants, along with silk screens, carved bowls, boomerangs and shields are for sale. Local artists make artifacts and create original pieces from local materials that are available for purchase. Lombadina also offers a range of tour options including Mud Crabbing tour, Ancient Footprints tour, Garr Kayaking Tour, Fishing Charter, Bard Country 4WD Tour and community walking tour. Weather you choose to stay at Lombadina or any of the other nearby options, make sure you find time to enjoy the sunset. A little further north is Kooljaman at Cape Leveque. Bundy’s Cultural Tour, Brian Lee Hunters Creek Tagalong Tour and the Buccaneer Archipelago and Horizontal Falls scenic flight leave from here. Check for tour times and availability to plan your day. The Ardyaloon community at One Arm Point is a short drive from here. The Community aquaculture hatchery, complete with barramundi, pearl and trochus shell is open to the public and conducts tours. Once you have worked out your schedule, its time to enjoy the stunning beach, read a book, go for a walk, take in some snorkelling, explore the reef or simply chill out and relax. Find out the sunset time and enjoy sundowners on the Western Beach followed by dinner at Kooljaman's alfresco restaurant Raugi's. Today you'll be exploring the Cygnet Bay Pearl Farm. In 1946 Dean Brown skippered a rickety wooden lugger into an unknown frontier to discover this hidden paradise. His descendents continue to operate what is now the oldest Pearl Farm in Australia, offering unique accommodation, pearl showroom, tours, swimming pool and the licensed restaurant, Shell. We recommend you try the restaurant's speciality, pearl meat. Your tour options here are by Land or Sea. We recommend you do Cygnet Bay Pearl Farm Tour and the famous Giant Tides Tour, one of the most extraordinary cruises on the peninsula. You'll be going through the Islands of the Giant Tides to experience the remarkable tidal flows of King Sound. This is a great opportunity to buy loose Cygnet Bay Pearls or pearl jewellery direct from Australia's oldest operating pearl farm. The sunsets are amazing up here, so enjoy your last sun-downer on the peninsula as you soak up the experiences. Tomorrow you'll be heading back down the road to Broome. After a leisurely breakfast and walk on the beach its time to head back to Broome town. There's no rush though, time stretches on the peninsula. As you drive back to Broome, if you missed Lombadina on the way up, make sure you drop in to visit their bush church and purchase delicious fresh baked bread from their wood fired oven and take in any stops you missed on the way up. My favourite sound track to driving this road is anything from the Pigram Brothers. This is that famous “corrugated road” they sing about. Today you are off on a Broome adventure. After breakfast, head to the Broome Bird Observatory on Crab Creek Road (unsealed road), 2 km past the Cape Leveque Road and on the right. Ring first to check tour times and best tides for viewing shore birds. For lunch visit The Mango Place – Kanagae Estate, 12 Mile. If you love mangoes you’ve hit the jackpot. Mango jam, ice cream, curries, cakes, tea, wine and more. The pizzas are delicious. Say hi to Julie & Geoff. After lunch check out the 12 Mile Bird Park – view over 600 birds and 100 different varieties. Make sure you arrive at Malcolm Douglas Crocodile Park in time for the 3.00pm feeding tour. 16km out of Broome on the Broome Highway. You’ll see salties, alligators, freshies and caimans. The feeding frenzy in the large lake is quite the spectacle! 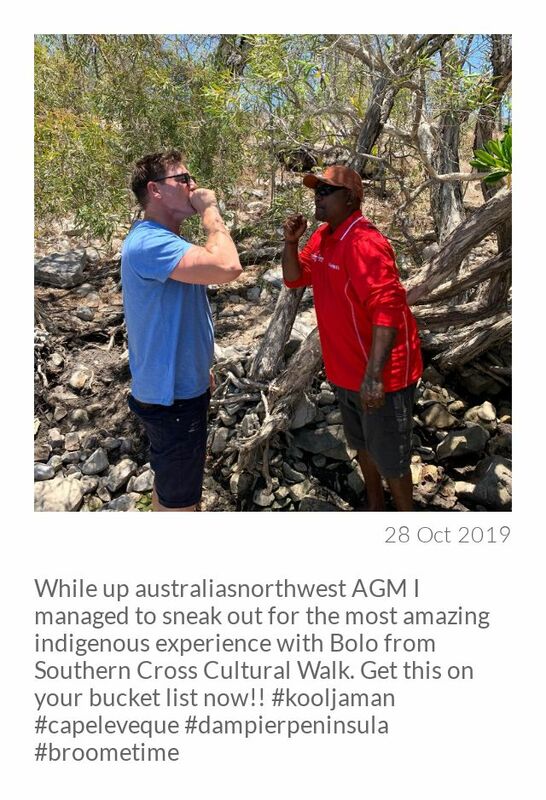 Alternatively do a walking tour with Bart Pigram Broome local and Yawuru man who operates Narlijia Cultural Tours – Mangroves Tour or Town Tour. Explore Chinatown, enjoy a relaxing massage at one of the day spas, relax by your resort pool or head to Cable Beach for a swim in the Indian Ocean. Before or after dinner head to Sun Pictures, the world's oldest operating picture garden. Now head to the Mangrove Hotel for a well deserved beverage. Sit back and relax and enjoy the view of beautiful Roebuck Bay. The view of Dampier Creek and the mangrove forest and creek systems is really special. For dinner tonight I suggest Matso’s Broome Brewery. Be sure to do a beer tasting, purchase a taste paddle. The Curry Hut is so good – authentic Indian. Your last day (potentially), lazy day before catching the big bird home. If time, enjoy your last swim and walk on Cable Beach, another wander through Chinatown our main shopping area. In the early day’s Chinatown was home to pearl sheds, hotels, billiard halls, noodle houses, opium and gambling dens. Hang out at a great café with good coffee, The Good Cartel (free wifi), The Lockup, Zookeepers Store, The Green Mango or The Aarli are a few of my favourites. Buy a good book for the flight home from Magabala Books, discover the real Unique Kimberley stories from this award winning independent Indigenous publisher for the flight home. Sadly it’s time to leave the colours of Broome. You’ll never forget the contrast of our azure blue water, pristine white beach sand and our red red pindan soil. No one goes to Broome once. See you next time! If you have time in Broome, explore Broome's creative community. Start at The Good Cartel for coffee. Located behind the indoor Twin Cinemas. This pop-up style cafe is Broome's coolest hangout. While you enjoy your coffee take in Broome's largest wall art by our own Artist Sobrane. Then look for these fine art destinations. Gallery Sobrane, Krim Benterrak, Short Street Gallery, the James Down Gallery and Nagula Jarndu Women's Art Resource Centre.